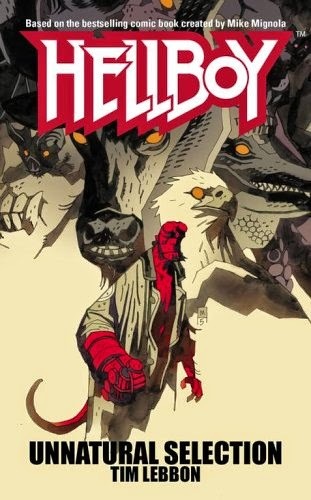 This Hellboy novel has references to the monster-fighting demon's involvement in the events of three horror movies. One is "something to do with pods" in 1978, a reference to the first remake of Invasion of the Body Snatchers. The remake is very different in its particulars from the original, though a few character names are at least partially retained: Miles Bennell becomes Matthew Bennell, Becky Driscoll is Elizabeth Driscoll, and Jack Bellicec is a main character in both. Presumably the makers of the second film gave the actual people involved the names of characters from the previous one in order to create the illusion that it was a re-imagining of the original story rather than a sequel. (It's also worth noting that Kevin McCarthy has a cameo in the remake where he appears to be playing Miles Bennell, trying to convince people of the invasion as he was at the end of the original.) Another incident was "a shark thing" in 1975, a reference to the film version of Jaws. A third episode was more recent, and involved giant insects that mimic human beings in New York, a reference to the movie Mimic, which was very loosely based on Donald A. Wollheim's 1950 short story of the same name. According to Christopher Farnsworth's The President's Vampire, the title character, vampire secret agent Nathaniel Cade, helped resolve the original Body Snatchers crisis. In the following book, Red, White and Blood, it is implied that Cade was involved in the events of Mimic. Perhaps he worked with Hellboy to help defeat the Judas Breed insects, though Guillermo del Toro evidently omitted their involvement in the incident from his retelling. It's also worth noting that Farnsworth's website formerly boasted a timeline for Cade's universe, which included an entry for the birth of Hellboy, who was not referred to by name. It's nice to see the Cade series getting a shoutout here, as I've noted since I started reading the series how crossover-heavy it was. 'The President's Vampire', especially, since if I recall correctly that one has an appearance of Derek Flint with profound implications of the Spy-FI section of the CU. Thanks for letting me know the timeline is still available. Yep, the Cade books definitely have some good crossovers, and Flint does indeed appear in THE PRESIDENT'S VAMPIRE. Farnsworth recently did a Cade e-novella, THE BURNING MEN. I just bought it, and hopefully there'll be some crossovers in it. Unfortunately, THE BURNING MEN didn't have any crossovers. Still a really good read though.